Amazon.com description: Product Description: This collection explores the theme of fragmentation within international economic law as the world emerges from the 2008 global financial crisis, the subsequent recession and the European sovereign debt crisis which began in early 2010. 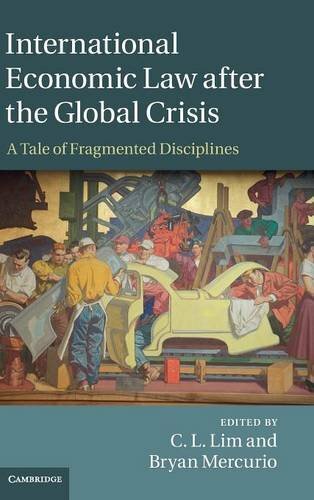 The post-crisis 'moment' itself forms a contemporary backdrop to the book's focus on fragmentation as it traces the evolution of the international economic system from the original Bretton Woods design in the aftermath of the Second World War to the present time. The volume covers issues concerning monetary cooperation, trade and finance, trade and its linkages, international investment law, intellectual property protection and climate change. By connecting a broad, cross-disciplinary survey of international economic law with contemporary debate over international norm and authority fragmentation, the book demonstrates that this has been essentially a fragmented and multi-focal system of international economic regulation.